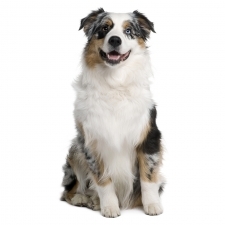 The Australian Shepherd, commonly known as the “Aussie,” is not from Australia, despite its name. The breed as we know it today was developed in the early 1800s in the Western United States. They were originally bred as stock dogs and were valued for their versatility and their easiness to train. Aussies started rising in popularity after World War I and have become known to the general public through rodeos, horse and dog shows, and movies. Today they have earned recognition for their eagerness to please and their skill in obedience. Aussies are considered working dogs and are happiest when they have a job to do. Although some are calm and easy‐going, Aussies are typically highly energetic and require a great deal of exercise and attention. This dog loves to have a job such as learning and practicing tricks, competing in dog competitions, or any activity involving their physical or mental abilities. They are kind‐natured, devoted, and loyal to their owners. In fact, they are one of the breeds known as “Velcro dogs” as they form intense bonds with their people. Aussies are intelligent and love to play. They make great watchdogs and are excellent with children. The Australian Shepherd usually weighs between 40 to 65 pounds and stands approximately 18 to 23 inches tall, reaching their mature size between 12 and 16 months of age. They are a medium‐sized muscular dog. Aussies have thick hair that tends to be straight to slightly wavy. They are beautiful dogs and have a similar look to English Shepherds and Border Collies. The Toy Australian Shepherd stands under 14 inches tall, and the Miniature Australian Shepherd stands approximately 14 to 18 inches tall, reaching their mature size between 12 and 16 months of age. However, as with any breed of dog, size can vary in their offspring when a standard sized dog is bred with a miniature or toy sized dog.